It's the end of this very short month and time to say 'Goodbye to February 2017'. 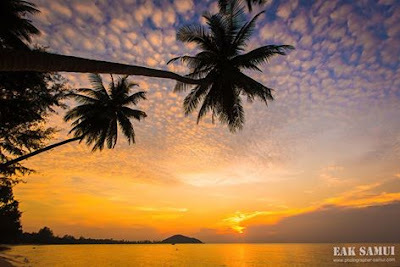 Besides 2008 and last year, February is usually a very nice month around Koh Samui and this year was no exception. 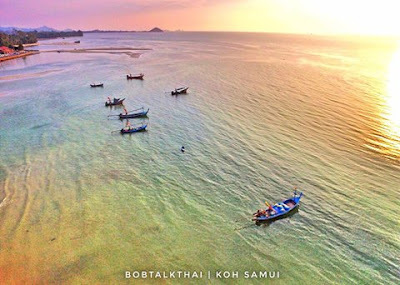 After the horrendous flood problems in December 2016 and January, just last month, it was time for a change and a break and Koh Samui got the break. The month was nice and sunny with most days partially clouded skies with lots of blue and sunshine in it. The island could warm up again and recover from the damage done by two consecutive massive rain and flood periods. 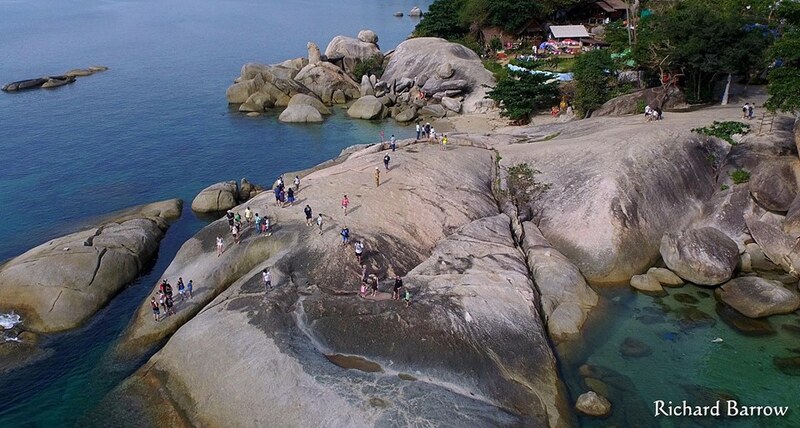 Lots of roads were fixed very quickly and it for the visitors it was a great time to hang out at the various Samui beaches, do some sightseeing and in general enjoy the atmosphere on our beloved island. There were only a few times when we had rain, mostly in the evenings or night anyway and yesterday saw a stormy day, with lots of rain and cloudy sky all day long. Today is already looking better again and the sun is out and about again, to send February off in good fashion. Goodbye to February 2017; The Naval Base in Lipa Noi was hosting a two night camping trip of our son's school and all kids in his school year went on the trip. This is usually not an area open for public but on this occasion, parents were allowed to visit their kids on the premises. This big anchor can be found there as well. It was a busy month for me, with completing a PADI IDC program on Koh Lanta and with just a travel day in-between, starting and completing another PADI IDC program on Phuket, before I could finally make it back home at the end of the month, having been on the road for almost a complete month. Both programs also saw some PADI Specialty Instructor training, which included a good couple of days diving! Goodbye to February 2017; Near the finish line of this years edition of the Surat Thani marathon, which I completed in a new personal best of 3 hours and 43 minutes, coming in twelfth all over and second in my age category, although only 78 participants started. Once back on Koh Samui, I enjoyed time being together with my family again, going out for dinner and lunch and slowly start running again after the Surat Thani marathon. Now it's time to look forward to next month, March 2017, which usually is also a very nice month with plenty of sunshine. See you around on Koh Samui! It's time for the Koh Samui, Thailand weekly weather update; 21st - 26th February, 2017. My time on Phuket came to an end with a Gas Blender course being taught on Monday and a great days of diving around the Koh Phi Phi dive sites, teaching PADI Specialty Instructor courses. A nice way to end an almost three weeks trip with two PADI IDC programs on Koh Lanta and Phuket respectively. Now it's good to be back home again for a while. Koh Samui, Thailand weekly weather update; 21st - 26th February, 2017; Big Buddha basking in the sun. This picture actually dates back to mid January, just after the floods and torrential rains stopped, It's great at the moment though, Koh Samui is well worth a visit with excellent current weather conditions. Last week the weather was excellent, all days had plenty of sunshine and only today had a little bit of rain. It was mostly partially clouded skies but as already mentioned, the sun was out each day. Great weather to spend a day on the beach or travel around the island and take in the views. The forecast for the next week is not that great, at least not as good as last week. Mostly partially clouded days are predicted, nothing new here, but with a bit more chance of rain. Tomorrow, Monday, may see a lot of rain with a bit less rain come Tuesday. Wednesday may be almost dry but Thursday and Friday could see rain again. Next weekend should be nice and sunny again though. Hang in there, nothing is lost, it will still be an enjoyable with bits and pieces of sunshine, nothing to worry about. 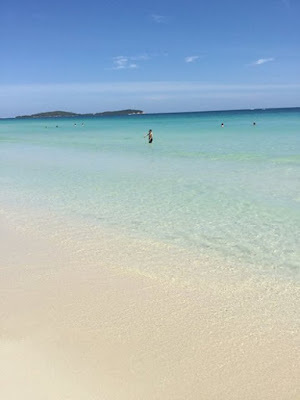 Do 'like' my Koh Samui blog Facebook page Enjoy the beaches around the island or in front of your hotel or resort and get some well deserved rest and a break. If you're done resting or need something else to do, there's plenty of things on offer on and around Koh Samui, you can go snorkeling or diving or take a dive course. You can also enjoy some of the trips I recommend, like a half day gourmet lunch and snorkeling trip at the Southern part of Koh Samui or a photography trip where you get to see the most photo genetic spots on the island or go for a drinks tasting tour if you like a tipple or two. Yesterday the PADI IE for February 2017 was completed and all of my candidates passed with flying colors. Job well done and congratulations are in place. 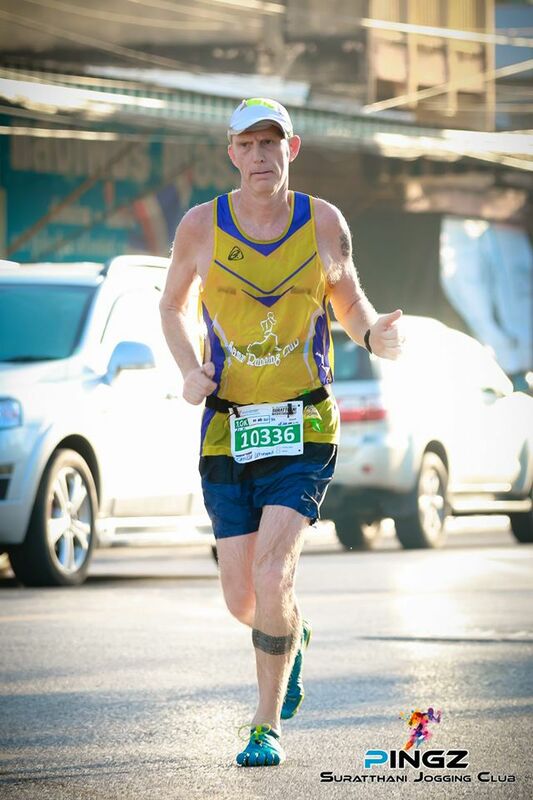 I was in Surat Thani yesterday where I participated for second consecutive year in the Surat Thani marathon and came in 12th overall and second in my age category (50-59), well chuffed with that result. I ran 42.17km in 3:43'31 or a 5'18 pace. Koh Samui, Thailand weekly weather update; 17th - 20th February, 2017; The Natural Museum in Wat Lamai, well worth a visit, but be careful, in that corner of the temple there's a brownish colored dog that likes to bite visitors. You have been warned. The forecast for the next seven is looking good, partially clouded skies all week long with an occasional shower. Great weather to enjoy Koh Samui. 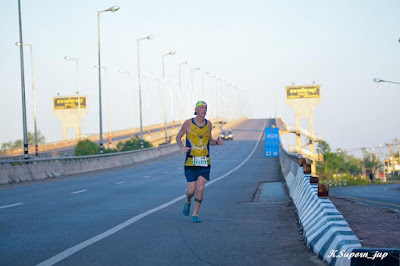 Koh Samui, Thailand weekly weather update; 17th - 20th February, 2017: Me during the Surat Thani marathon, within the last 8km of the race, at the new bridge, linking Surat Thani and the bypass road to the Surat Thani airport. As already mentioned, great weather conditions for the next seven days around Koh Samui to enjoy the beach and get some well deserved rest and a break. If you're done resting or need something else to do, there's plenty of things on offer on and around Koh Samui, you can go snorkeling or diving or take a dive course and with a bit of luck you may spot one of the whale sharks visiting currently the dive sites, especially Sail Rock. 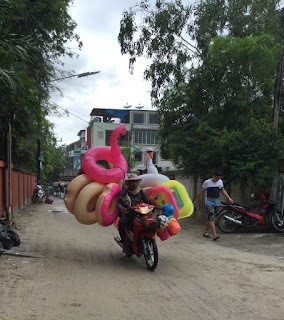 Today is the 10 year jubilee for the Koh Samui info and weather blog. This is something I never expected to happen, but with this first post here it all started and became an integral art of my life. Ten years with almost uninterrupted daily updates, I'm amazed myself. There will be a few changes coming up though, I will stop updating the blog on a daily base but will continue to update on a weekly base, over the weekend, either on a Saturday or Sunday. Local events and other events that require or deserve attention, may get daily updates. It will be a lot more flexible from now on. Stay tuned, I hope it will become more interesting for all of you. It's an ideal day to hang out and relax at the beach, go on a dive trip or of you're not certified as a diver, sign up for a Discover Scuba Diving trip or the PADI open water diver course and enjoy the current great diving conditions or get a bit more active on the island itself and decide to explore and enjoy and see the island. There are various tours on offer and I can help you book lovely half day gourmet lunch and snorkel trip in the South of the island or join a photography tour during which you will visit the most photogenic locations around the island or if you like a drink or two, join the drinks tasting tour around the island and learn how to make some cocktails as well. Please contact me for more information on any of the tours on offer. 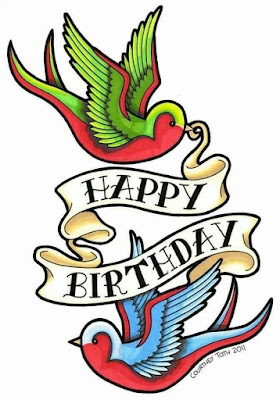 Tomorrow will be the 10th year anniversary of this blog! A few changes to the concept of the blog will be revealed. The forecast is looking really good, sunny skies are ahead of us during the next seven days or possibly also some partially cloudy skies. Not much rain is predicted, maybe a few rain drops during Thursday afternoon or Sunday morning. Enjoy the good weather but be careful with the sun exposure and have some sun lotion within hand reach! Koh Samui, Thailand daily weather update; 14th February, 2017; Statues at Wat Lamai for making merit or 'tamboon' as the Thais say. Wat Lamai is well worth a visit, especially the 'Koh Samui' or natural museum inside the temple is worth checking out. The weather forecast for the next seven days has changed and for the better! Gone have the windy and wet days coming up as of tomorrow and they have been replaced by blue skies and partially clouded skies with an occasional drop of rain, if at all. A great opportunity to enjoy the beaches around Koh Samui or get active and join one of the many activities that Koh Samui has to offer. I can help you with booking a dive trip or a dive course, so you can enjoy the current great visibility and abundance of fish at the dive sites or get out and about with one of the following tours; a half day gourmet picnic and snorkel trip in the Southern part of the island, get to see the most photo genetic and scenic parts of the island during a photography tour or try some tinkle at various tasting stations around Koh Samui with the drinks tasting tour. Custom made tours are also available, please contact me for me more detailed information on any of these options. Koh Samui, Thailand daily weather update; 13th February, 2017; Big Buddha surrounded by trees, under a partially clouded sky. Big Buddha is located in the north eastern corner of the island, not too far away from the airport and is well worth a visit. Great views can be had if you climb up to the platform where the Big Buddha statue is housed. A great opportunity to enjoy the beach for another two days and than get active, dive trips or courses can be booked, the visibility is great at the moment with lots of fishies everywhere or if you're interested in island based tours, you can participate in a half day gourmet picnic and snorkel tour, a photography tour at the most scenic locations of the island or a maybe drinks tasting tour is more to your liking? Contact me for more information on any of these activities, diving or touring the island and I will get more detailed information to you. Koh Samui, Thailand daily weather update; 12th February, 2017; Wat Laem Suwannaram or Wat Plai Laem, our neighborhood temple with the Meh Guan Ihm statue, an iconic statue on the island in the most interesting temple and beautiful temple on the island, at least in my humble opinion. The forecast for the next seven days is looking nice and sunny until Tuesday, with mainly blue skies and a strong wind today. From Wednesday onward we have a bit more clouds but still plenty of sunshine and possibly a shower on Wednesday. Still great weather to enjoy the beach or take a dive trip or dive course, there's currently great visibility at the dive sites, or explore a bit around the island and I can offer you some guided and private tours to do so. There's a half day gourmet picnic and snorkel tour at offer, a photography tour at Samui's most scenic locations and a drink tasting tour can be booked as well. Contact me for more information on all of the landbased tour options and the diving options available to you. Koh Samui, Thailand daily weather update; 11th February, 2017; Seen in Kata, Phuket, a shop selling rice in combination with a wooden shack tattoo parlor in the back of the shop, the perfect and logical combination, right? The forecast for the next seven days hasn't changed that much, between this afternoon and tomorrow morning but plenty of sunshine after that again for the rest of the week, maybe with a partially clouded sky. Enjoy. Great conditions to enjoy the beach and relax, kick back and do nothing or of you like some activity, go on a dive trip or take a dive course or take a tour, like the half day gourmet picnic and snorkeling trip, a photography trip or a rinks tasting trip. Contact me for more information on any of these activities. Yesterday there was no update thanks to Bill Gates. Windows 10 was updating to a new version, but after 15 hours without any movement, and a previous 7 hours of getting a 42% part update, I decided that was enough and re-booted my computer. It was way too late in the afternoon, early evening to post an update. So, thanks but no thanks Bill! The forecast for the next seven days is looking good. Saturday afternoon and Sunday morning may see some rain and strong wind but other than that it is sunny skies and warm weather. Great weather to hang out at the beach in front of your resort, book a dive trip or course or go on one of the tours that you can book with me, like the half day gourmet lunch and snorkel trip, a photography trip or a drinks tasting trip. Contact me for more details! This morning I will drive over to Phuket and start a new PADI IDC program there tomorrow. Koh Samui, Thailand daily weather update; 8th February, 2017; Tinglish (a mix between English and Thai) can be very funny at times. This building can be found near Ban Saladan on Koh Lanta, next to the police station. Let the games begin? The forecast for the next seven days remains looking good. Possibly a bit cloudy tomorrow, and as of Sunday some stronger wind and possibly some isolated rain showers on Saturday. Plenty of sunshine ahead of us though and a great time to relax at the beach, take a dive trip or dive course and enjoy the excellent current diving conditions, or participate in one of the island tours you can book through me, a half day gourmet picnic and snorkeling trip, a photography tour or a drinks tasting tour. Please contact me for more information on any of these options and get the most out of your stay on Koh Samui! Yesterday all IDC candidates passed their first day of the PADI IE, around mid day we should have seven new PADI Instructors! Koh Samui, Thailand daily weather update; 7th February, 2017; Big Buddha baking in the sun. It's hot and sunny around Koh Samui, enjoy it! Koh Samui, Thailand daily weather update; 7th February, 2017; One of the ferries connecting Koh Lanta with Koh Phi Phi and Phuket. There are also ferries going 'the other way', they're going south bond towards Koh Lipe and further on into Malaysia. Most if not all of these ferries dock and leave from the Ban Saladan pier, in the northern part of the island. The forecast is looking great, sunny skies more or less for the next seven days with stronger wind come the weekend. Enjoy, go to the beach but don't get sunburned, take a dive trip, go on a trip around the island, participate in a gourmet lunch and snorkel trip, participate in a photography tour or sign up for the drinks tasting trip. All great activities to participate in when on the island. Life's a beach! Contact me for more information on one of the trips mentioned. On Koh Lanta a warm and sunny day seems also the be in the making and it's showtime for my PADI IDC candidates, since today the PADI IE or exams start. They should be ready though and tomorrow afternoon I hope that I can welcome seven new PADI instructors to the world! Yesterday there was no update since I was on the boats all day long, from 6 in the morning until almost 5 in the afternoon. Koh Samui, Thailand daily weather update; 6th February, 2017; Three deities at Wat Lamai, overlooking the scene! Be careful when visiting this Wat or temple, if you enter and walk to the left, to the Museum, there's a vicious brown colored dog who likes to bite people. Yesterday saw partly clouded to very sunny day all around Koh Samui and it's starting to warm up again, slowly but surely. Max temp reached 33C and it's been a while since we clocked these kind of temperatures. Koh Samui, Thailand daily weather update; 6th February, 2017; Sunrise over Ban Saladan on Koh Lanta yesterday morning, on the boat setting up the dive equipment. What a great way to start the day and what a privilege to be able to witness such beautiful part of the day. Another day in paradise! This morning I was out and about for an early morning run and enjoyed another beautiful early morning sunrise. The next seven days are looking good. Partially clouded ti sunny skies are expected around Koh Samui with possibly some strong wind come next weekend. Enjoy it and book a tour, diving or around the island , get out and be active. You can book dive tours and courses as well as a half day gourmet picnic and snorkel trip, a photography trip and a drinks tasting trip with me. All well worth and enjoyable under the current and expected circumstances. Contact me for more details. A few of my PADI IDC candidates and myself will be on the boat, diving over the next two days, before the PADI IE start on Monday morning! But first it's time to enjoy and relax. Koh Samui, Thailand daily weather update; 4th February, 2017; Sunset at Lipa Noi. The good weather is back on Koh Samui and is here to stay! There forecast for the next seven days is looking very good, how about blue skies with occasionally a cloud in it? Excellent conditions to relax at the beach or go out and about and see and explore the island, on your own or with a tour, like the tour options that you can book through me, the half day gourmet picnic and snorkel tour, the photography tour or the drinks tasting tour. Diving is also top notch now, with the water clarity getting better each day and lots of fish to see and flat oceans. Please don't hesitate to contact me for more information an any tour option you may be interested in. Koh Samui, Thailand daily weather update; 3rd February, 2017; A small snake with a relatively long body, spotted at the pier at Ban Saladan on Koh Lanta, part of his body can be seen among the plans on the left bottom corner. Any idea what species this is? It was maybe half a meter long. The forecast for the next seven days has changed slightly with some rather unexpected rain predicted for today but the rest of the weekend and next week should be sunny to partially cloudy again and in general is showing a very pleasant weather forecast. Plenty of opportunities to enjoy the beach or any of the many activities and options you have around Koh Samui, including one of the tours you can book with me, being the half day gourmet picnic and snorkel tour, the photography tour and the drinks tasting tour, Contact me for more information and enjoy next week! The forecast for the next seven days remains very good and promising. After today all days should be very sunny with at worst a partially cloudy sky and at best just plain blue skies. Very nice weather ahead of us, time to book some tours to keep yourself busy or plan a relaxation day or days on the various beaches around the island. Enjoy it! Hi and Welcome to February 2017, one of the best months in the year to visit Koh Samui! It's usually very nice and sunny without having the scorching hot temperatures that we have later in the year and there's not much to hardly any rain. A perfect month to visit. A great month for diving, clear water and flat oceans or to participate in other water or land based activities or join one of the tours on the island that I endorse, the half day picnic and snorkel trip, a photography trip or a drinks tasting tour. Well worth your time, enjoyable and relaxed. Selling floats at Chaweng beach, the day before the floods started in January! In total contrast on how February most likely is going to be. Until half way through the month I will be on the road, currently I'm on Koh Lanta for a PADI IDC and once that is over I will go straight to Phuket to start another PADI IDC program on 9th February. Come 16th February it's time to celebrate, this bog will turn 10 years young! Come Sunday 19th February I will run my first race of the year, the Surat Thani marathon and I plan to finish in under four hours. Hope you will enjoy this month! Stay tuned for more updates, I'm also planning some changes in the blog, which I will mention later this month. Aerial picture of Hin Ta and Hin Yai in Lamai, or Grandmother (Yai) and Grandfather (Ta) rocks. 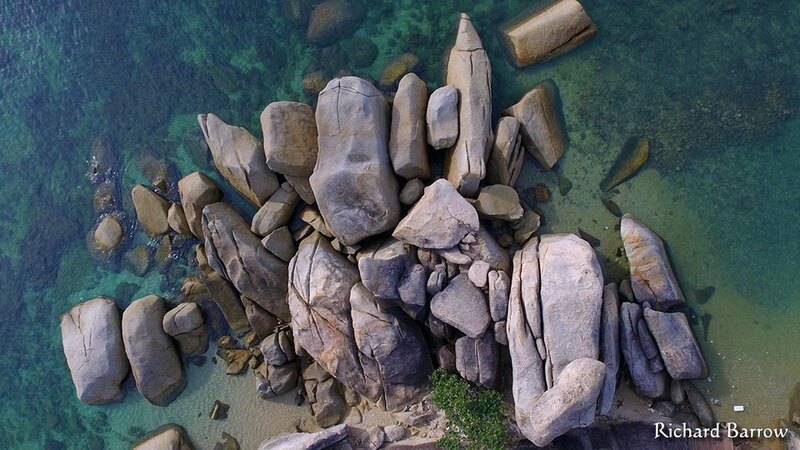 The beautiful rock formation and look respectively like female and male genitalia. Yesterday saw a nice and sunny and sometimes partially cloudy day over Koh Samui with a max temp of 31C A great way to say goodbye to January 2017! Koh Samui, Thailand daily weather update; 1st February, 2017; Ban Saladan on Koh Lanta, the narrow one way road next to the klong or river, looking towards the ferry pier. The forecast for the next seven day is still looking, possibly partially to fairly cloudy tomorrow and Friday but other than real nice blue skies should be hovering over Koh Samui for all other days. Enjoy, get a tan and don't forget the sun lotion!